Breakfast is the most important meal of the day. It’s what gives each of us a jump start on our day. So it’s important to fuel not just our bodies with a healthy meal, but our families as well. What can you do though when everyone has over slept and there’s no time to sit down for breakfast? Have you ever had family and friends over for brunch and wanted to make omelets for everyone, but don’t because you’d all be eating at different times, not to mention you’d be cooking at the stove all morning? Would you like to serve a great breakfast for your child’s slumber party? Watch the video below for a quick and easy recipe for making an omelet in a zip-lock baggie. Each person can add their own favorite ingredients, AND everyone can sit down at the same time to eat them. 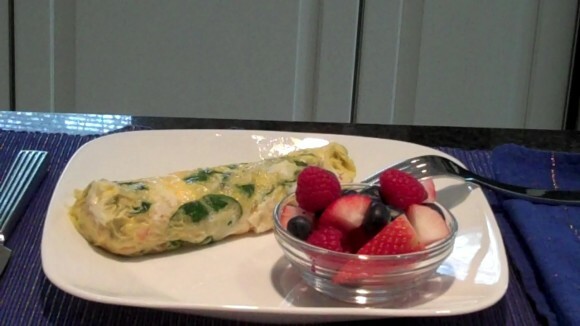 As for that “no time for breakfast in the morning” – wrap up this omelet in a tortilla, and you can eat it in the car or take it to work for later. I think you’ll love this idea for breakfast, brunch, lunch or dinner. VERY cool Vicki, you did a wonderful job putting this together! What a great idea!! Wow! Fun idea! I usually just go with scrambled eggs when it’s a crowd. This is terrific — thanks. What a cool and creative idea!! The omelet has turned out great, Vicki. Wow, what a cool idea. Can’t wait to try out this easy and fuss free method. Thanks for sharing, Vicki ! Very simple! I really enjoyed the video and would love to try it. I have seen this done on TV and videos and I always convinced myself that the texture was crap. If YOU say it’s good, I’m in! I have never seen this done before, Vicki…such a great idea! I will be giving it a try asap! Nice post! This is so cool. Going to try this out! I have a friend who makes these all the time…especially when she has a small group of friends over for breakfast. I need to try them. This is sooo cool Vicki!! What an awesome idea!! Totally trying this sometime! That really is so cool and so much fun making omelette. Thanks for sharing. Sounds a great idea, just make sure that the zip log bag is heat proof and food grade enought…. That’s a really cool idea!